This is the third and final recipe on the menu that I created for the recipe contest on Kraft’s Breakstone’s sour cream microsite (the appetizer on the menu is the Cucumber-Tomato Bruschetta in Phyllo Cups and the entree is the Italian Chicken Salad Sandwiches). 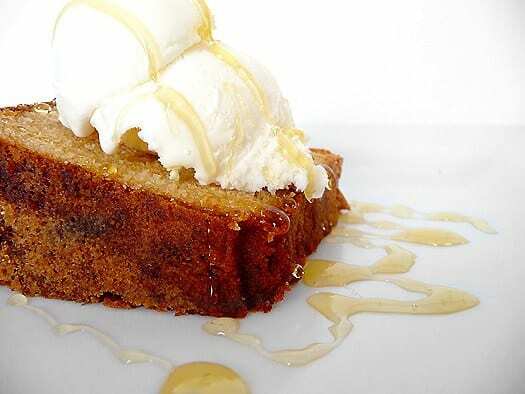 This pound cake is a perfect ending to a bright and light summer meal. 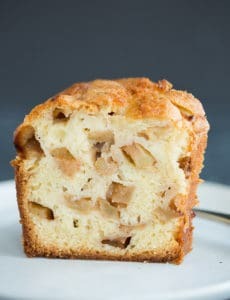 The sour cream in the cake creates a lighter texture than your typical dense pound cake, and the addition of honey and vanilla makes the cake unbelievably moist and so incredibly flavorful. 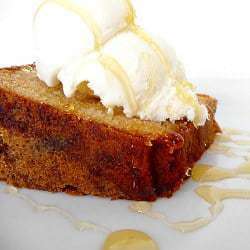 The versatility of the cake is one of the best reasons to make it – you could serve it with vanilla ice cream and drizzled with honey (as you see here), but you could also top it with grilled fruit – bananas, pineapple, and peaches would all be great! – and add a sprinkling of shredded coconut for a tropical twist. It’s a great basic recipe that you can dress up to suit your tastes. Disclaimer: This post was sponsored by Breakstone’s Triple Churned sour cream in conjunction with the recipe contest. 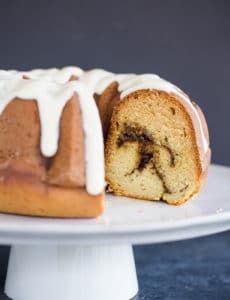 This pound cake is perfect for any occasion! 1. Preheat oven to 325 degrees F. Butter and grease a 10” tube pan. 2. In a medium bowl, whisk together the flour, baking soda and salt; set aside. 4. In a separate bowl, whisk together the Breakstone’s sour cream, eggs, vanilla and honey. flour mixture and mixing until just combined. Use a rubber spatula to give the batter a final mix. the middle comes out clean. 7. Cool completely before serving. Leftover cake can be stored at room temperature, wrapped well with plastic wrap. Made this last night for my mother-in-law, this is right up her alley. The cake is delicious in all it’s simplicity, no doubt. But the smell as it was baking was unreal! We were all salivating, and hat after a huge meal! As soon as it was out of the oven we had some, couldn’t wait:) I actually really liked the sweetness level and wouldn’t change a thing. Great recipe! 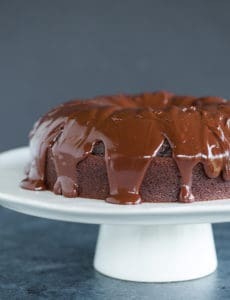 Hey, guys—I know this cake is the type of treat you should only indulge in, every once in a while, but is there any way to use less than 3 cups of sugar? Thanks for any tips/help that you can provide! Hi Ali, I wouldn’t recommend reducing the sugar; traditional pound cakes are heavy on the butter, sugar, flour and eggs, which is what makes them so heavy and dense. Will I be able to get the same results if I use a jelly rolll pan? I was asked to make a cake for about 100-150 ppl. I really like this cake and think other will too. Hi Debbie, Unfortunately, the cake will not turn out the same if you use a jelly roll pan. I would not recommend going that route with this recipe. Thank you for your prompt response. Will have to think of something else. 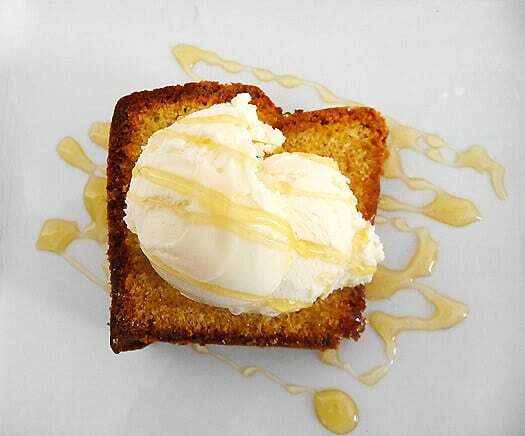 I’ve never made a pound cake before, but this photo of a nice, tasty slice with ice-cream and honey on top was more than enough to convince me. I know the idea of a pound cake is to add the same measure of each basic ingredient (flour, butter, eggs and sugar), but I chickened out when confronted with three cups of sugar and only added two. The cake was sweet enough, and otherwise unaffected. There was a little piece inside, in the very center, near the base of the cake which appeared slightly slack-baked, but I’m not sure if that was because of the lack of sugar or something totally different. Other than that, the cake was pleasantly soft, but hearty and not too dry – definitely something to sink your teeth into. I served it with honey and thick Balkan yoghurt. Found this as Tastestopping! It looks sooo good! Hi Chris, so happy to hear that you are your husband have enjoyed this cake so much! I made this recipe today for muffins. It came our perfectly. I used 45 minutes for the time. Taste great with and had a very good crumb. Thanks for sharing. Hi Michael – Muffins! What a great idea! Thanks so much for sharing! You might find the pan conversions helpful on the Conversions page: https://www.browneyedbaker.com/conversions/. That way you can convert based on volume, which should help. How many muffins did the recipe make, 12 or 24? Oh yummy!! I tried voting for you, but non US residents can’t! honey vanilla and sour cream! sounds decadent fluffy and amazing! I made this yesterday and it came out really yummy. I baked it in a bundt pan and had to leave it a bit longer than the recipe said, and should have left it even longer. I liked it even better today–the outside stayed a bit crunchy and the flavor was just really rich and delicious. It’s the first time I’ve made pound cake, and I was quite impressed. I made this pound cake last night. It was copletely cool by 3am. It is now 7:40pm and there are about 3 slices left. I’ve had 3 requests from my “testers” to make one for their houses. I LOVE your site and your recipies. This looks absolutely delicious! I voted for you today. Wishing you all the luck!